Neal Chism: Saturday I went out rowing on the river and it was an 8 out of 10 stinky day pulling trash out of the watershed. Sunday, Laura grabbed my dumpster key away from me and went diving in a different way. And Monday, I had no words for this image. Today I had to go out early this morning and fix a flat tire on my wife’s car on the side of 599, and all I could see was trash next to the road ready to walk down towards the water. Usually images of marine debris are somewhat hopeless. A mermaid caught in a fishing net, lying (presumed dead) on a sandy beach. Beaches covered in trash. Dead birds with belly full of plastic. These images, as powerful as they are, don’t always work for me. My message is one of strength and hope. Empowerment. Dream big. That was the concept behind this shot. We shot ‘up’ (i’m standing on the hood of a jeep) with the sky behind me and the cranes almost ….bowing in the background, or perhaps a marine sword salute… a near perfect frame. I wanted the message to personify the river… We may have polluted it to the point of being a superfund site, taken away half her flow, but the Duwamish still stands. The Duwamish still carries Seattle on its back, our industry, our pollution, our …humanity, but still she flows, ever powerful, unstoppable. This power, the power of nature to recover once we take our boot off its neck and give it a chance, is the power of hope. The most powerful movements find their roots in hope. A few years ago I the tiniest kernel of an idea to shoot some concept art photos addressing issues surrounding Puget Sound, and also some awareness generating (not all doom and gloom) art that would hopefully give the audience a moment of pause, and hopefully a smile. There was even discussion of a calendar <grin>. I was still in the data collection phase though, still learning what was relevant and what was simply me feeling randomly incensed. Fast forward… I’ve thrown caution to the wind and have given up the stable 9-5 (well, 7-3 or 11-7) life in the hospital and am pursuing creative endeavors, not limited to video production, educational program development, web design, content generation, social media, brand identity/voice (the list goes on and on). Environmental activism is only a part of the big picture. All that said, I still was having a hard time making time to just make it happen. Mental blocks, insecurities, etc..
Read: needed a kick in seat of pants. 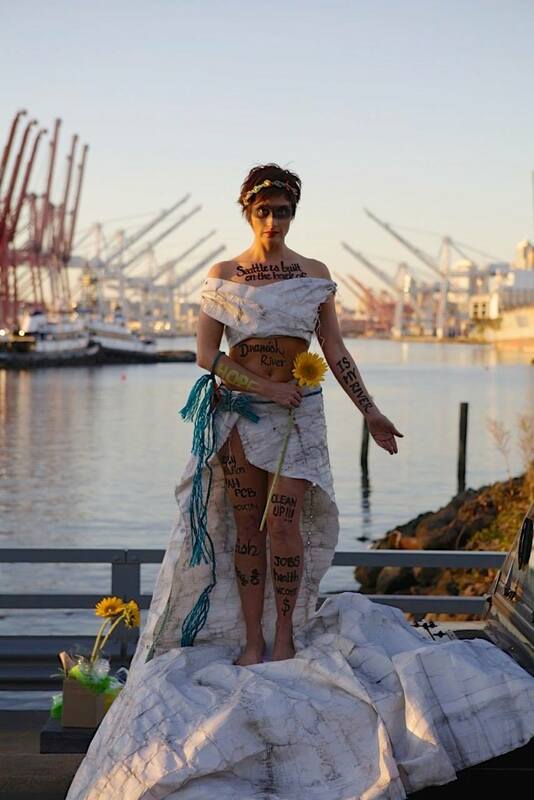 Enter stage left: Duwamish River Cleanup Coalition “River for All” Stand up and win big photo contest. Winner takes all, a Kayak ride with Macklemore (read his blog post on the Duwamish River)! If thats not incentive to go dress up in a trash toga, i don’t know what is!! This image is a test run for things to come! There are stories I want to tell about the Duwamish River, but the majority of them with all the pertinent details are best left told by the people who are directly involved. Folks like Alberto and James. This is a working waterfront, a shipping port, a tribal waterway, lots of competing interests, numerous stakeholders. The river is suffocating in trash, our random trash, blowing off streets and parking lots, yards and sidewalks. Cleaning up legacy pollution is a massive undertaking that will benefit the both the inhabitants of the river, the people living on its banks from a direct contact point of view, but if done right will also help create jobs. Externalizing the cost of business on the environment should be banned. If we do the cleanup right, there is hope for a less polluted future for the watershed, but only if we start way way back up stream and get some of the industry polluting the green river under control as well. I wanted this image to be nonpartisan. I am in this for the overall health of Puget Sound, and until we start seeing everything that flows into the Sound as a part of the bigger picture, from stormwater to treated sewage, rivers clean or dirty, ALL of it – we won’t stand a chance. There is no one offender in my mind, we are all part of the problem, and we can all be part of the solution. I’m sure there will be people who read more or less into it. 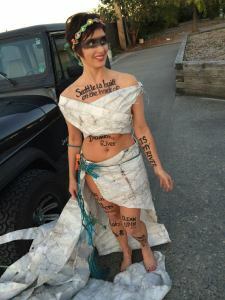 The outfit was created by my friend Rachel out of trash collected from the Duwamish River, the ultimate “Thrift Shop” costume. The writing was done by a new friend Vanessa who makes beautiful Typeface logos from scratch (ping me if you want to be connected) and BtS video shot by Lamont G. and edited by me. BtS Duwamish #riverforall Photo Contest shoot from Laura James on Vimeo. Awesome, Laura! We love it!!! I agree with you 100% Laura, the worlds bodies of water, oceans, rivers and lakes are what keep us alive. We have a duty to take care of them.